Plone Community has an attitude to partecipate to events in person, both official communication events like conferences and free technical events like sprints. Abstract ­­has an attitude to contribute to Plone by organizing some of these important moments in the life of our community. The Sorrento Sprint is one of these moments, and we are proud to invite you to join us for its 5th­ edition in a row. 1. The PEOPLE are something you can't miss! 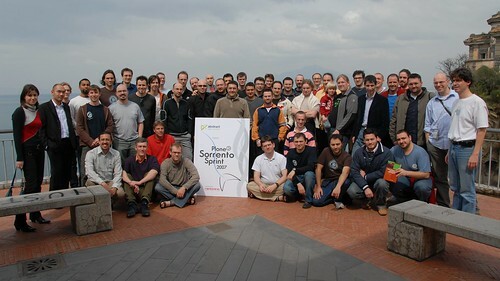 A lot of smart Plonistas attended the past editions, and we hope they will rejoin us. Nonetheless newcomers are very welcome, cause a sprint is the perfect way to join the Plone Community, improve your comprehension of Plone while giving back, and share big fun! 2. The LOCATION is something you shouldn't miss! A ­wonderful hotel overlooking the ­gulf of Sorrento, with plenty of space inside and a nice park outside. With a bit of luck you will enjoy the nice weather of Spring in the south of Italy, and possibly go for a swim in the sea. have a look at some pics from the past! Go to the sprint's project-home and sign your name there, then follow the istructions that you can find here (link).